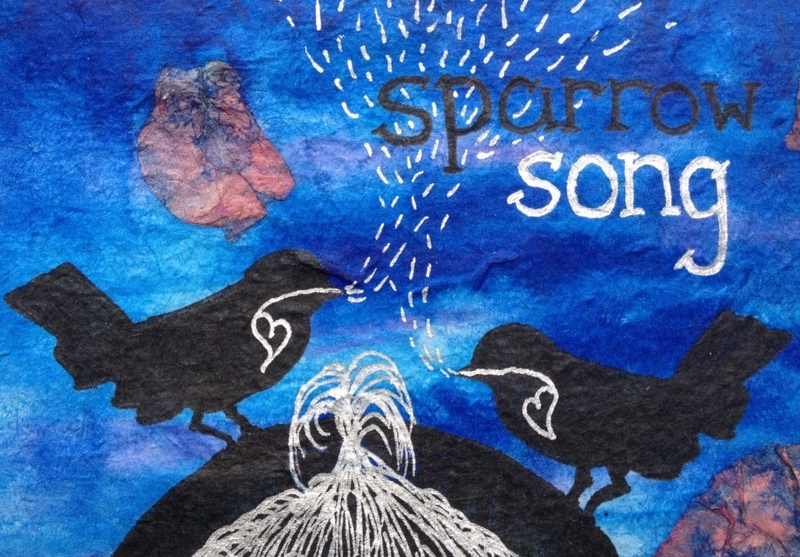 Watch this space for news and updates that will be coming soon about on sparrow song, who are in the process of re-launching with a new emphasis, post the Sanctuary’s relocation and one of their members’ maternity leave. 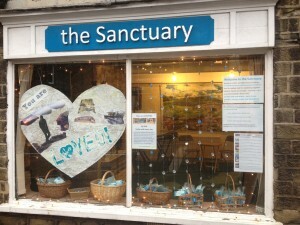 As a result, for several years we’ve found ourselves conducting a kind of evangelism that feels very natural to us – it’s simply been an overflow of who we are… and so it’s come out through creating art installations in windows, poetry and allegories, singing on the streets, hand-crafting gifts, hand-writing letters and cards of encouragement and using social media to proactively bless and affirm. You can browse some of this work here. For the most part, it’s been really well received and so we felt it was time to try and distil and share some of the lessons we’ve learned. Please do contact us if you want to share your stories or ask us any questions about ours. E is for the everyone peace must be born in to really fly. A fraction then, compared to how he loves us, each and every one. Rest assured then, this Christ-with-us, there is always hope. Why, and how, there truly can be peace on earth. So let it be born in each one of us again God, and let it fly! A big thank you to sparrow song, Stephanie and Jill! Just a few hands (and voices) make light work… and can fly together beautifully to give peace away to hundreds of people! We’re praying now that each dove that has flown home with someone will make it onto their tree and remind them again and again of our prayers and Jesus’ love and peace – given for them, and for the world he so loves. 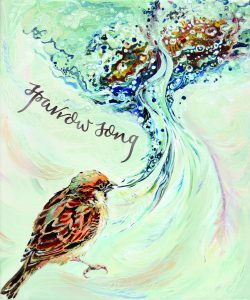 You can find out more information on our sparrow song page – where you’ll also find a brand new ‘taster’ so you can understand just why they have been described as having ‘a sound like the smell of warm caramel’. Sit back, close your eyes, and let Anya and Liz sing you Amazing Grace by heart, and from the heart…. 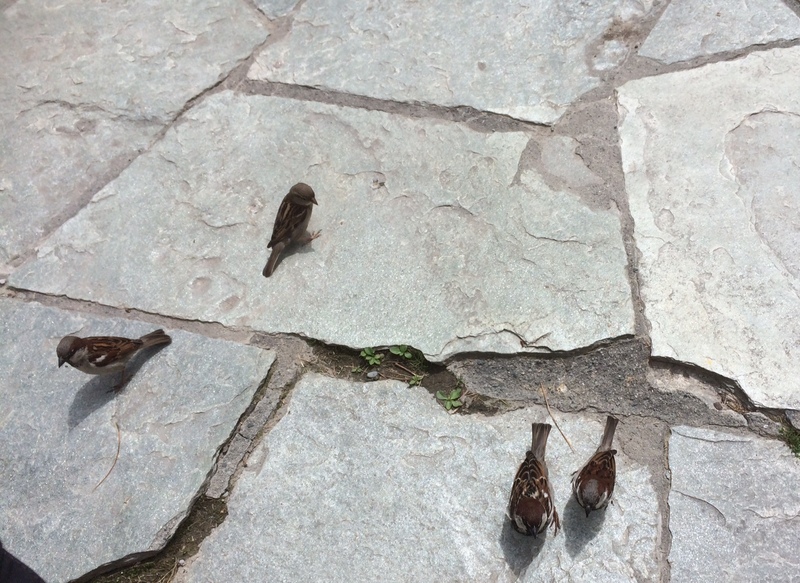 “Sparrows are common. Everyone knows that. They’re not on the list of must-see sights to take in anywhere you visit. But they’re special to me. I’m an all-round animal lover and these small garden birds are no exception. They are so intricately crafted, and make such distinctive, delicate movements with their heads. And you rarely get very close to them before they fly away in fear. 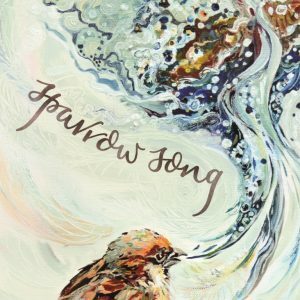 84 has been my favourite psalm for years because it expresses such longing and delight to be in God’s presence, and sparrows make an appearance in it… they are described as having found a place (together with the swallows) right by God’s altar – they are valued and welcomed right in; how much more so then are we? 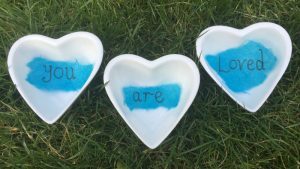 Jesus talks about sparrows too, saying that God loves them enough to know when even just one falls – and urging us therefore to know just how much more deeply we are loved… for we have so much more value. So sparrows have become associated for me with our access to God’s presence and our preciousness to him – seeing them is like a promise with bones and feathers on. 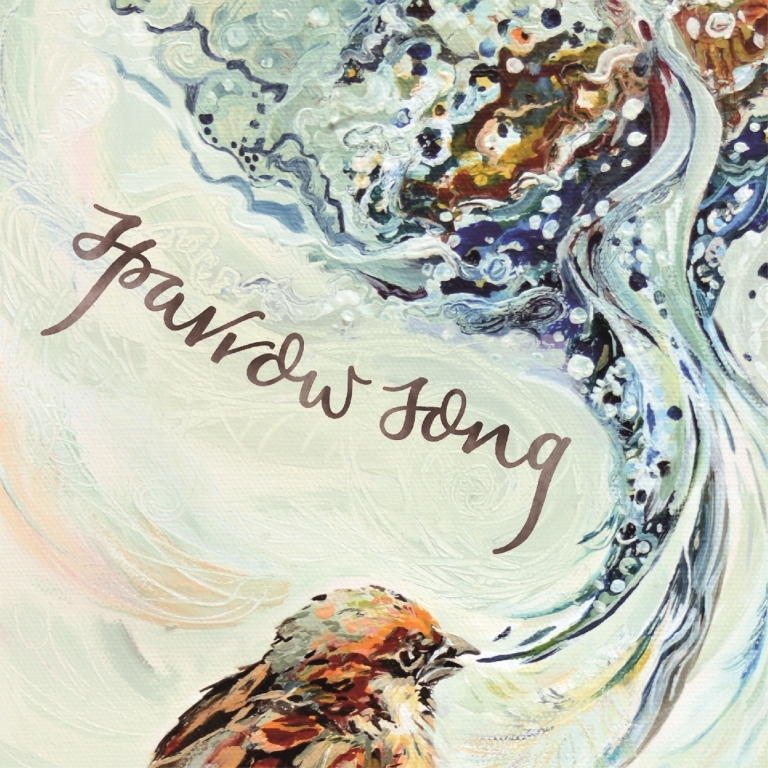 And this has only been increased since I formed a worship busking duo with Anya Faull called sparrow song – partly inspired by these scriptures and partly by the fact that sparrows are not song birds, so any melody they could offer would have to be a supernatural gift to them… and those who heard them. 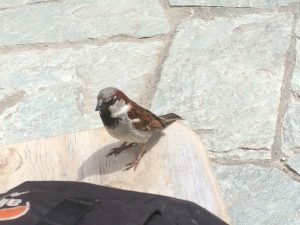 So as I sat eating my lunch in the town square of a beautiful Alpine town, it was unsurprising that although they had none of the mountain grandeur or fresh, foreign appeal of my other surroundings, a number of sparrows coming seemingly impossibly near to me literally made my heart sing. Because after all, as I have shared, they have great value to me. I couldn’t believe how close they came! Schooled in getting a feast of bread scraps from the array of delicious deli sandwiches being eaten by different visitors, they knew it was worth the risk to wait for food only centimetres away from my feet. And the braver ones were soon on the seat next to me, and on the back of the bench courageously edging even further towards me. I loved feeding them the flakes from my crispy bread – and of course they came even closer still then. And stayed. It was special in itself, but it was also a moment of seeing with greater clarity just how much God delights when we choose to come close to him – just how much his heart rejoices to share good things with us. But my admittedly somewhat whimsical reflections were soon interrupted by stamping and shouting. It was coming from another bench in the park area – or more accurately from the couple who were sitting on the bench. They had some tame sparrow visitors too, but there was no delight in it for them. They saw the sparrows as inconvenient, or perhaps even as vermin. I could tell this because their hearts betrayed themselves every time one of the tiny birds came close. Their faces were twisted into angry frustration and they stamped and shouted so that the sparrows fled. I genuinely felt grieved in that moment. And it just struck me again, deeper than ever, that our actions towards things – and people – come out of how our hearts value them – or don’t value them. 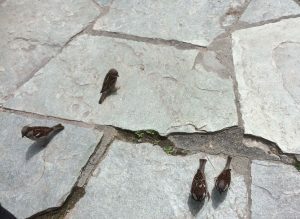 I didn’t have to try to be nice to the sparrows – I didn’t feel I was doing them a favour or engaged in an activity that was ‘the right thing’; I was just genuinely just delighted to spend that time with them, give them a feast and see how close they would come – and all because of their deep worth to me. Our new term begins with morning worship at 9am on Tuesday and we’re excited about all that’s coming up. View all our special events here and download or print the full Summer Calendar for the Sanctuary. We’re looking forward to seeing lots of you very soon! very exciting plans currently formulating to bless everyone around us for Yorkshire Day on Monday 1 August. …plus of course there’s the small matter of our album coming out in just a couple of weeks now – eeek, it’s so agonisingly close now, it’s getting harder and harder not being able to share it with you quite yet. But soon and very soon! 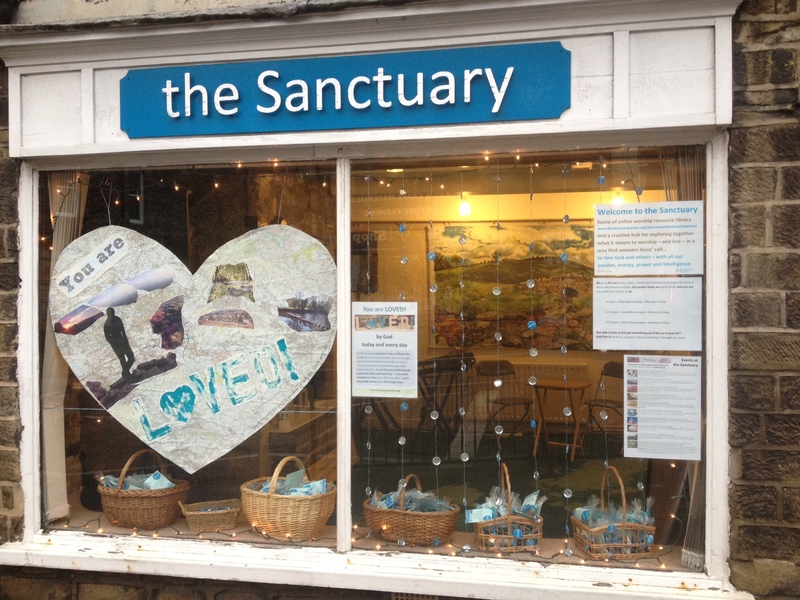 It’s our centre’s first day open this term. It’s great to be back. And to celebrate, we’re sharing this term’s programme of events, activities and special prayer foci with you. Find out what’s planned here and then transfer it straight into your diary so you don’t miss out… we’re looking forward to seeing you! Monthly topical foci – some issues come to the fore in some seasons and – alongside praying for them on an ongoing basis, we often choose to dedicate a monthly special focus to them. Our current monthly special foci are environmental justice (1st of the month when Mon-Fri), the persecuted church (2nd Tuesday of the month) and trafficking and modern day slavery (21st of the month when Mon-Fri). Find out more details here. sparrow song – our resident song-birds will be singing through our open door four times this term so passers by can listen and/or drop-in. You can hear them on Saturdays 13 and 20 Feb and 12 and 19 March, always from 2:30-4:30PM. Inspired by busking, we’ve launched a new initiative we’re really excited about! sparrow song are a duo made up of jazz singers Anya and Liz. They love singing songs they know by heart – from the heart. And they love taking these very special songs beyond our walls and out into public spaces – that way anyone can listen to their heavenly harmonies and hope-filled lyrics for free.